Read Rake In the Benefits of No Back Pain by Dr. Gabrielle Freedman to learn more about Family Practice of Chiropractic and our Chiropractic office in Quincy, MA. We look forward to serving you! Call - (617) 472-4220. Autumn season is upon us! Our senses come alive as many of us are beginning to enjoy the sight of the beautiful and majestic colors displayed on our trees, the touch of coolness in the air, and the smell of bonfires. We know the beauty is short-lived for the beautiful trees soon lose their leaves and decorate our lawns with piles of wonderful and less exciting dead debris. That beauty also comes at a price for our backs, necks, and shoulders as we sweep, gather, and dispose of the leaves more than once this season. So if your home is subjected to leaves falling each year, follow these helpful tips and avoid the consequences of leaf-raking on the body, including strain and pain in the neck, the upper and lower back, and the shoulders. Side Yard Stretches: Stretch before you begin working in the yard. Stop and take time to stretch periodically through your garden work. Begin with knee-to-chest stretches, trunk rotations, and side bends with hands above the head, palms up and fingers weaved. Spend 10 to 15 minutes all together on your stretching. Intersperse the work with a short walk to get the circulation going throughout the body, and do the same stretches as a cool-down once you have finished. Proper Position: As you rake, stand erect with your head held up. It’s All In the Stance: Use a “scissor” stance when raking; that is, keep one foot forward for a few minutes, then swap and put the back foot forwards. The Bend: When bending to pick up leaves or any other trash, bend at the knees, not the waist. Mowing: When mowing the lawn, put your whole body into the pushing, not just your arms and back. Start Your Engine: When starting a mower with a pull cord, bend at the knees and extend up in a smooth motion. Do not twist at the waist or yank at the cord. Protection is Key: Keep well-hydrated by drinking plenty of water, and wear a hat in the sun. Always wear shoes and protective glasses, and use gloves if your hands are likely to receive rough treatment that might raise blisters. When using loud machinery, employ ear-protectors, and if you suffer from asthma or allergies, use a mask. Simple Tools: Try to use ergonomically-friendly tools that help take the strain from your muscles and joints. Put It On Ice: An ice-pack can be used to ease any discomfort you feel following raking or other outdoor work. 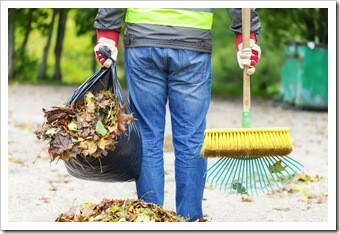 Enjoy the autumn leaves but remember to follow the tips to rake in the benefits! If your discomfort does not dissipate within two to three days please contact our expert team. This entry was posted on Tuesday, October 2nd, 2018 at 10:54 am and is filed under Health Articles. You can follow any responses to this entry through the RSS 2.0	feed. You can skip to the end and leave a response. Pinging is currently not allowed.